Confederate “spy” and wartime nurse. Also a talented vocalist and pianist, music teacher, and millinery shop owner. 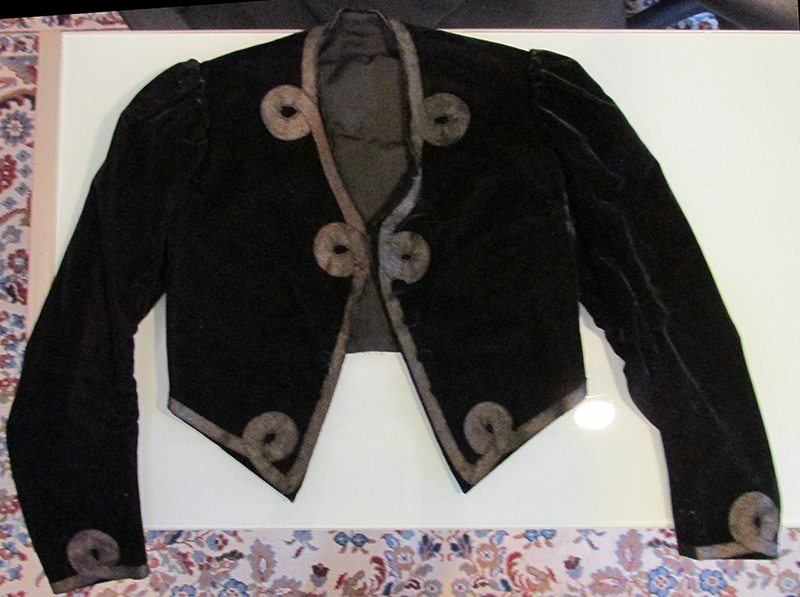 Green velvet embroidered jacket created by M. L. Herrington. The youngest child of Shepherdstown businessman Joseph Entler, Mary Lou grew up in her father’s Great Western Hotel. During her youth, she received some formal education at Fairfax Hall in Virginia. The locals knew her as a superb vocalist and talented pianist. Just twenty-one the beginning of the war, May Lou was an ardent Southern sympathizer who one afterward described as “full of life and vivacity.” In the winter of 1862, the Rebel lass became involved in secretly carrying Southern mail between Shepherdstown and Charlestown. That fall, she joined many other women caring for Confederates wounded at the Battle of Antietam. Later on, they began tending soldier’s graves in Elmwood Cemetery. Entler recounted her wartime adventures in a short memoir. Mary Lou’s most thrilling escapade was a six weeks odyssey that began in early-May 1863, when she assisted a Sharpsburg teenager named Sallie Zittle in a scheme to get beyond Union line, meet with General Jeb Stuart and convince him to help Zittle’s half-brother Andrew Leopold. A lieutenant in the 12th Virginia Cavalry, Leopold then imprisoned at Fort McHenry, was awaiting trial in a military court on charges of murdering two civilians, seriously wounding another, and being a guerrilla. Captured at Berryville, the Federals eventually transferred the girls to Harpers Ferry and held them under guard at Stipes’ Boarding House. In mid-June, when the Confederates threatened Harpers Ferry, the provost marshal sent the girls to Baltimore. Once there, they finally recited the loyalty oath and were released. In February 1865, she married Walter Herrington, a Baltimore & Ohio employee Mary Lou had met during her stay in Harpers Ferry. Their childless union lasted until Walter’s death in 1874. Mary Lou spent the remainder of her life in Shepherdstown teaching music and running a millenary shop. A committed Christian, she often boasted of reading the Bible through thirty-five times.